ProCell Gold insulation delivers long-term fire retardant protection; will not melt or propagate fire. 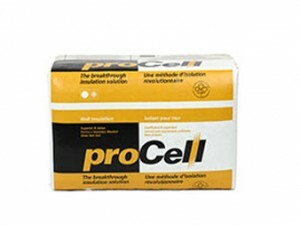 ProCell is a fast-dry application facilitating prompt installation of vapour barrier and drywall. Versatility make it a product of choice for various applications. Does not itch or contain any formaldehyde nor release harmful emissions. These charts represent average machine applied coverages which may be affected according to equipment and applicator’s techniques. Thermal Resistivity = 25.4 m K/W = 3.66 / in 25 lbs per bag. Coverage per bag for wood framing includes a 10% correction factor (positive).